Online advertising is embarking on its 18th year, but it’s still being used more to inform than to engage. To help it reach its full potential to inspire and resonate with people the way that more traditional forms of advertising have in the past, Google’s Project Re:Brief set out to inspire a new generation of digital thinkers by capturing the creativity of the past. Their goal was to show that to come up with great digital advertising, you must first come up with great advertising. Google selected four of America’s most memorable TV ads from the 60’s and 70’s—for Coca-Cola, Volvo, Alka-Seltzer, and Avis—and called on their legendary creators to re-imagine their ads for the Web by using the technology of today. The result was the complete modernization of some of the most recognizable advertising campaigns of all time, by the minds who made them. The original “Hilltop” line came to Bill Backer, McCann-Erickson’s creative director, while he was waiting to catch a flight. He scribbled the words “I’d like to buy the world a Coke and keep it company” on a napkin. Then with the help of songwriters Billy Davis and Roger Cook, the line was turned into a song recorded by The New Seekers, a well-known British band. 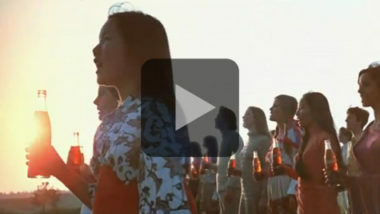 For the television ad, McCann’s art director, Harvey Gabor, came up with the idea to create “The First United Chorus of the World,” a group of young people from around the globe who stood on a serene hilltop singing “I’d like to buy the world a Coke,” which brought the song to life as a message of joy, unity, and hope. More than 40 years later, that ad still connects with people on a deep emotional level because it’s based on a strong, relevant message. With Project Re:Brief, Google wanted to inspire a new generation of creative minds by showing how today’s digital technology combined with brilliant creative thinking can elevate advertising to new heights. That principle is demonstrated in the digital reworking of the “Hilltop” ad. The reimagined commercial opens with footage from the original ad, but now enables users to literally “buy the world a Coke” from their mobile device or computer by connecting with someone on the other side of the world through online display advertising. Utilizing Google’s state-of-the-art digital platforms, Mr. Gabor and the Google team came up with the vision of letting people select a location, attach a personal message using text or video, and watch as the Coke is delivered to a specially functioning vending machine across the world. Because the messages are translated and close-captioned using Google Translate, nothing is lost in translation, no matter where in the world the Coke is sent. The recipient of the Coke can then send back a thank you message from the vending machine. It’s the magical marriage of inspiration and the Internet in advertising designed for today’s audiences. To see how Harvey Gabor and Google used today’s digital technology to reimagine Coca-Cola’s classic ad, check out this video presented by Google and directed by Doug Pray. MDG Advertising, one of the top online advertising companies in Florida, with offices in Boca Raton and New York, NY, specializes in developing targeted Internet marketing solutions, exceptional creative executions and solid branding and media buying strategies If you are interested in combining great creative with today’s digital technology for an impactful online advertising strategy, contact MDG Advertising at 561-338-7797, or visit mdgadvertising.com.